The Meetup which was planned for Thursday Nov 7 2013 about Positive Diversity has, for scheduling conflicts, been postponed. My apologies to those of you who had planned to attend – but we will reschedule and let you know the new date. The event will be at the very cool TeqCorner in McLean, and will be hosted by our friends at Positive Business DC. We look forward to seeing you in the not too distant future, when together we’ll explore new approaches to diversity with a focus on strengths and well-being. 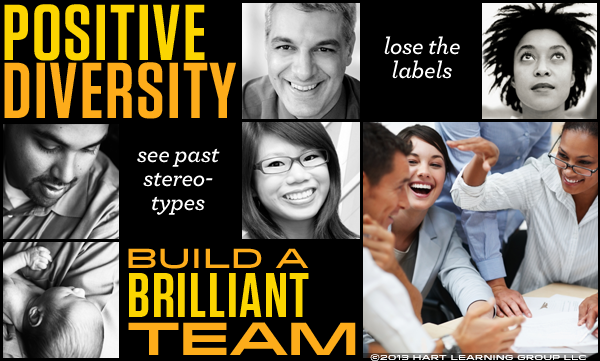 Positive Diversity goes beyond race, gender, and ethnicity, to emphasize the work styles, passions, and shared values that we bring to the workplace. Knowing how to recognize and nurture these strengths helps us make sound choices in the hiring process, and build high performance teams. I love reading the latest research and sniffing out relevant facts from Neuroscience and the hot new field of Positive Psychology, and I’ve got some interesting insights to share. For example, did you know that creating a work culture in which people feel comfortable talking about their strengths and differences can dramatically improve team performance and engagement? We will want to hear your take on these issues – what has your experience shown you? What core lesson would you like to share? What challenges have you faced that we can learn from? We will need your input, so once we are back on the schedule, please join us! In the mean time check out the great selection of books in the Professionalism & Diversity section of our website bookstore, and if you would like to know more about our training seminars and bootcamps, please drop us a line.